Meet Chicago Native and Las Vegas, Nevada local Rob Gorodetsky. He’s known for his large wagers and high stakes cash poker games. With the biggest day of betting at $1.5 million he’s certainly a bigger bettor at his age (26) than Billy Walters or Jon Price were. Of course as Price and Walters got older and continued to refine their craft for betting on sports they wagered far greater numbers and took home millions of dollars over the long run. The DailyMail in the United Kingdom and the USA Today recently did a feature on the kid who fancies Supreme Louis Vuitton hoodies and custom painting of himself. 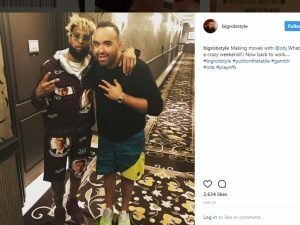 He likes to use a tag labeled: “BigRobStyle” and on instagram is said to sell his sports betting packages for $500.00. Rumors have it that Vegas Dave Onacea is a front for his sports gambling. In a recent quote ItsVegasDave confirmed that his big wagers were the result of a large inheritance from his wealthy Hawaiin family and he lost far more than he ever made wagering in sports. He says that he now is just a tout who sells his sports betting predictions and does not wager on sports anymore. As of March 21, 2016 Rob Gorodetsky has a Nevada LLC registered under his name called BRS Investments & Co, LLC with a Chicago, Illinois mailing address of: 550 N. ST. CLAIR ST., APT. 1606, CHICAGO, 60606, IL. It is rumored that Odell Beckham Jr. wanted him to place a $20,000 wager for him and that the popular R&B singer Drake wired him $100,000 in Vegas to bet on sports with. The offshore sportsbook William Hill has confirmed over $24,000,000 in wagers which may be as a result of betting offshore to unload risk a common practice bookmakers partake in. Our news editors and journalists have done a feature covering Big Rob Gordetsky over at SIT News for those following this breaking story. Sitting courtside for NBA Games and at center field for NFL games he certainly has a love for sports and is in with celebrities from Beverly Hills to New York. He touts himself as the most successful sports bettor in the world and has an email address of info@bigroblasvegas..com and a website http://www.bigroblasvegas.com/ where he touts betting picks and advice for those who want to try this betting advice.